Be the first to share your favorite memory, photo or story of Edie. This memorial page is dedicated for family, friends and future generations to celebrate the life of their loved one. 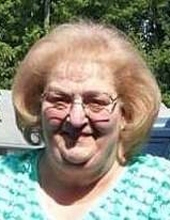 Edie Ann Lore, 73, of Avon, IN died Wednesday, March 13, 2019 in St. Vincent Hospice Hospital in Indianapolis. She was born February 14th, 1946 in Terre Haute to Morgan and Ida Fulk. Edie spent most of her life in Terre Haute. Edie is survived by her husband of 56 years, Denny Lore; two children, David Lore (Donna) and Robin Sweitzer (Scott); seven grandchildren, David, Jr., Jeremy (Bre), Candace, Emilee (Jason), Sarah, Katelyn and Delaney; and four great-grandchildren, Addeline, Josh, Lane and Landon. She was preceded in death by her parents; and two brothers, Victor and Larry. Funeral services will be conducted at 7:00 PM, Wednesday, March 20, 2019 in Callahan & Hughes Funeral Home, 605 South 25th Street. Visitation is scheduled prior to services from 4:00-7:00 PM. Private burial will be in Roselawn Memorial Park. Funeral information may also be found at www.callahanandhughes.com . To send flowers or a remembrance gift to the family of Edie Ann Lore, please visit our Tribute Store. "Email Address" would like to share the life celebration of Edie Ann Lore. Click on the "link" to go to share a favorite memory or leave a condolence message for the family.